Each piece of glassware is hand painted. 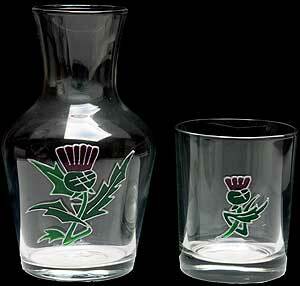 The design is drawn by hand onto the glassware with a gold liner. Then glass paints are used to infill the design. Once dry, the piece is oven fired to bond the paint to the glass. Finally, for added protection, each piece is varnished, enabling the glassware to be hand washed. Each piece comes with care instructions. Carafe (17 x 10cm) and glass (9 x 7.5cm), boxed.